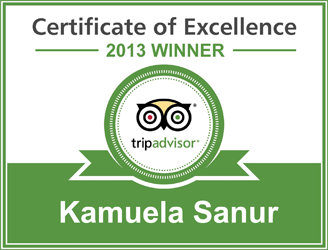 Sanur – Bali, September 2013 – As a particularly noteworthy achievement, Archipelago International's Kamuela Villas & Suites Sanur has received the Certificate of Excellence 2013 from TripAdvisor – an award that is based entirely on the experiences and satisfaction of the guests. Tripadvisor's Certificate of Excellence is awarded to hotels that have consistently earned travelers praise on the TripAdvisor website, whilst maintaining an overall star-rating of four or above. These honest, impartial evaluations are testament to the outstanding hospitality and popularity of the Kamuela Villas & Suites Sanur, proving a following of contented, delighted guests. Enveloped by graceful gardens, the Kamuela Villas & Suites Sanur feature 7 private pool villas in a choice of one, two and three bedroom configurations. 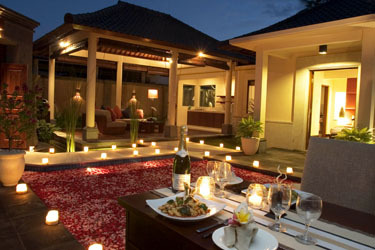 The property also comprises of 12 sophisticated suites which afford large private terraces and luxurious jacuzzi tubs. Each suite and villa is entirely private and self contained, allowing guests total relaxation for their honeymoon or retreat with their family or friends. Paying homage to Balinese traditions, the villas and suites are built, furnished and decorated in a Balinese style, topped off with a modern-minimalist edge. Local timber, tiles, fabrics and artifacts meet large outdoor living areas, stocked with all of the contemporary comforts necessary to ensure guests experience a relaxed and memorable stay. Nestled on the coastal stretch of Sanur's white sand beach just 30 minutes from Ngurah Rai International Airport, the location of Kamuela Villas & Suites Sanur enjoys the best of both worlds. Set aside from the frantic vibes of Kuta and Seminyak, whilst avoiding the snoozy ambience of Nusa Dua and the Bukit Uluwatu, many consider Sanur to be 'just right', offering the perfect balance between urban living and a secluded getaway.